The 1st Monday each month at 1145 hrs at Hofbrauhaus Newport, KY (Cincinnati area) 200 East 3rd Street, Newport, KY 41071. 1377 Community Park Dr, Columbus, OH 43229. SFA 45 at Hofbrauhaus Columbus 1130 hrs Thursday 8 NOV upstairs. THE THIRD ANNUAL 3 GUN SHOOT WILL BE HELD PICKAWAY COUNTY SPORTSMEN CLUB, 8100 STATE ROUTE 22 EAST, CIRCLEVILLE, OH, 43113. PCSC Special Forces appreciation day. Join the Buckeye Chapter 45 of the Special Forces Association as we welcome home Company B, 2nd Battalion, 19th Special Forces Group (Airborne) and their families from combat deployments. The Special Forces Association (SFA) will honor these brave men who have sacrificed for our safety and freedom. Event Date and location: Saturday 29, September 2018. Pickaway County Sportsmen, Inc. Circleville, OH. The 2018 Shoot will have different categories of shooters with awards for each category champion: SF Guys, Civilian novice shooters, 3 Gun “Pro” shooters, Seniors, etc. Did you know it takes longer to train a Green Beret than it does to train a fighter pilot? Come shoot with the best! 1. 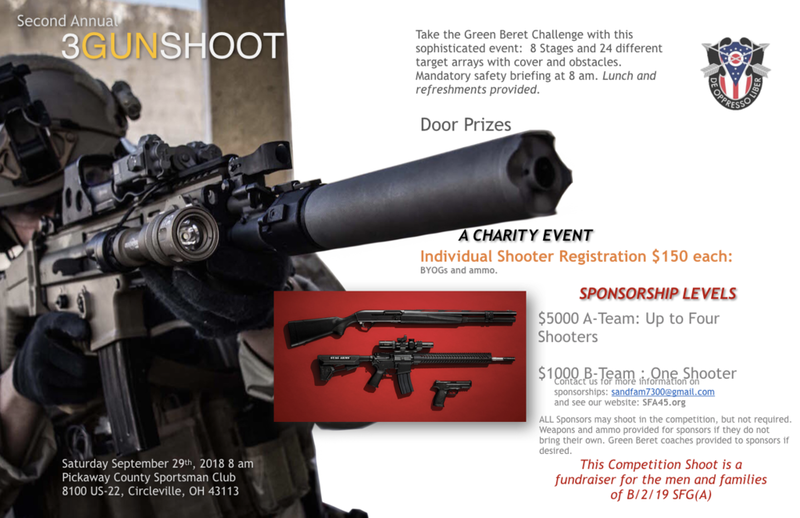 $1000 sponsors can shoot with and be coached by a team of Green Berets who just returned from a combat deployment to Afghanistan. 2. $5000 sponsors can do the same and may bring one to three others to shoot. 3. Other donations are also welcome. We will provide the weapons, ammunition, meals and coaching for the $1000 and $5000 sponsors. These patriotic sponsors need only bring a good attitude and the SF guys will do the rest to make this a very enjoyable and memorable day for them; almost all of them are Ohioans. Sponsors can shoot all four bays and 12 iterations, or fewer. The net proceeds of this event will go directly to supporting the men and families of this Special Forces unit. AD Farrow Harley Davidson just north of Columbus at I-71 Exit 131 (Route 36 exit). AD Farrow will host with live bands, free lunch, and terminate the Rally at the Buckeye Lake Winery. Ohio National Guard will provide for recruiter type support including climbing wall, military vehicles and Blackhawk helicopter. SFA Chapter 35 Northern Ohio President, Walt Emerson, briefed Chapter 45 regarding this fundraising event for the Medina, Ohio 9/11 Memorial. The event is sponsored by the Medina Rotary; cost $45 per person; includes a gourmet buffet and open bar for beer and wine. MSG(R) Chris Spence, 5th SFG horse soldier veteran, will be the guest speaker. Larry Verne shared information about Team Fastrax Warrior Weekend To Remember organization which partners with Ohio Challenge. 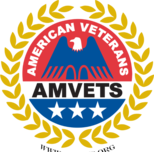 They will host a three-day event for Gold Star Families, Purple Heart veterans, and all veterans; it is scheduled for 18-22 July. Current details and how to donate can be found on warriorwtr.com. If you wish to be recognized as a wounded veteran at this event, then contact the organization at BS3G.com and apply online. The event includes tandem skydives, balloon festival, shooting range, 5k race, and golf outing for the warriors. The 2nd Thursday each month at 1145 hrs at Hofbrauhaus 800 Goodale Street, Columbus, OH 43212. As the Green Beret Foundation launches the inaugural Riverboating for Berets, we have graciously received support from Tristate businesses, and individual donors through sponsorship and donations for the bourbon excursion events. Donations raised through the event will help fund the Green Beret Foundation’s mission to connect U. S. Army Special Forces Green Berets and their families with the resources needed for healing from injury, family support and transition to life after service. Eighty-six percent of every dollar raised on behalf of the Foundation goes directly to those they support. Through their generosity, we thank Tristate supporters for understanding the meaning of “Value the Sacrifice and Contribute to the Healing.” We hope you will join us for the 2018 Riverboating for Berets; A Bourbon Excursion as we grow our Tristate network of supporters. God Bless! The 2018 Riverboating for Berets: A Bourbon Excursion will be on Northern Kentucky’s own B&B Riverboats. The riverboat will depart for a cruise on the Ohio River across from downtown Cincinnati. Guest will enjoy bourbon tastings and entertainment while cruising with several retired Special Forces Green Beret. 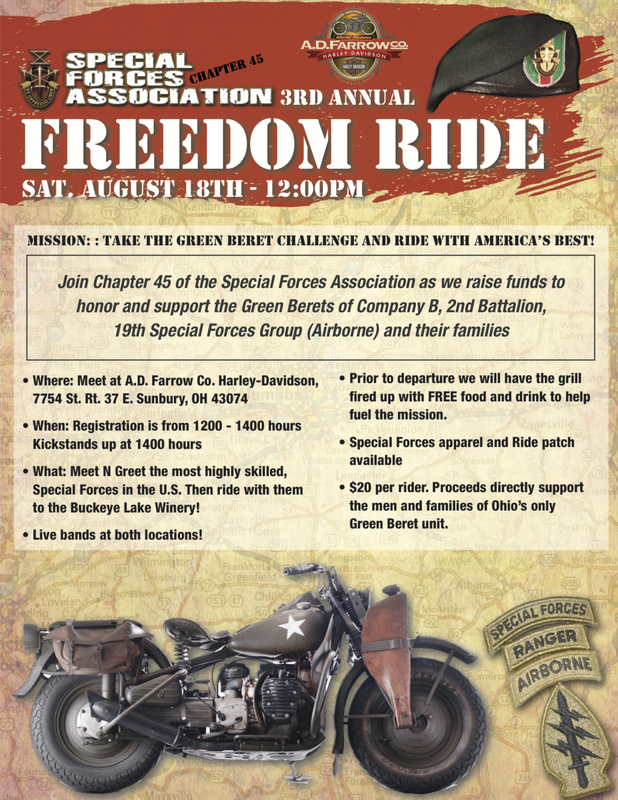 There will be items auctioned off and additional ways to contribute to the Green Beret Foundation. As the organizers of Riverboating for Berets, we are excited to announce the first private bourbon barrel pick to be released on the Riverboating for Berets event. This unique barrel will only be available to guest of the event. A special thank you to Buffalo Trace Distillery for choosing the Green Beret Foundation to be part of this coveted barrel pick program.